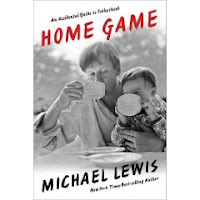 Having previously read three different Michael Lewis books (which I reviewed here), I was interested to come across mention of Lewis in a Nancy Gibbs essay from Time Magazine titled "Parenting Advice: What Moms Should Learn From Dads". In additon to having some very interesting commentary about fatherhood, Gibbs wrote about a new book by Lewis titled "Home Game: An Accidental Guide to Fatherhood". Based on his series of articles for Slate Magazine, it stitches together some of his experiences with his three children (not really germane to the book itself, but I also found interesting that Lewis is married to former MTV VJ Tabitha Soren). Having now read the Lewis book, I can say it's an extremely fast read that contains some entertaining vignettes and insights about fatherhood. - The idea of fumbling around for the definition of and actions required of being a good father. A murky idea that has changed greatly through the years, and you just gotta make it up as you go, and have it seem both right and livable to you. - The trauma on a first child at the birth of a second... or on the first two at the birth of a third. Following this, the inherently challenging task of two continuing to raise little functioning (almost) members of society while providing the stuff needed to stay alive for an additional member. As Lewis describes it, what previously could be done in a tag-team fashion on one child now involves much more separation of parental labor to make it happen. - The seemingly spot-on description of the difference between paternal and Maternal love. That being that father to kid bonds need to be formed through action (helping keep alive and later just helping the young 'un) and mother to kid bonds are there from the start (that whole giving birth to thing). - The notion of how the adult world for a child is likely a crazy, grotesque place where everything is odd and everyone sized wrong. As an example of this insane place kids inhabit, Lewis retells the anecdote of his oldest daughter asking prior to a flight about his "chickens in luggage"... yep, that's check in luggage to those who actually know different. - The family trauma that came after the birth of their third child, Walker. First Postpartum Panic Disorder for Tabitha and then a respiratory virus (RSV) for the baby. Tough times, but really touching stuff about Lewis in effect standing guard over Walker while in recovery at the hospital. Reminds me of the first point made in this review... fatherhood is something that in many ways you have to make up as you go along. Good stuff and worth the read for father-types. Couple of interesting articles from the most recent Fast Company Magazine. First and foremost is an investigative report titled "Beyond the Grid" by Anya Kamenetz. It looks in great detail at the concept of small-scale household or business power generation and it's potential. Not surprisingly, this idea of a "micro-grid" is being fought by large power utilities looking to prevent this competition by either installing and controlling it themselves or by simply making it go away. What's also very interesting in the piece is the mention of clean-energy advocates such as Al Gore trumpeting the idea of an "electric super-highway"... which is much less efficient and more costly than the micro-grid. Fascinating piece. Also from this issue is the cover story "Amazon Taps It's Inner Apple" about the company's dominance of the online book market and impact on the larger brick and mortar based publishing industry. Closely tied into that is the speculation of how Apple might get into the fray with a larger version of it's iTouch / iPhone that could compete with the Amazon Kindle. Another interesting piece is "Why Walgreens Is Building Its Own Universal Health-Care System" about the clinics that Walgreens operates in both it's retail stores as well as onsite at various companies. The retail-based side is interesting from it's ability to offer quick and easy (read: affordable) health care to the uninsured, but the corporate located side even more interesting in it's goal of keeping a company's employees healthy and productive. Last story to note is titled "Why America Is Addicted to Olive Garden". As someone who doesn't find appetizing the idea of eating at Olive Garden, I was interested in this story not so much from being about the food, but rather about the corporation and how it's run. Just finished reading "Treasure Island" by Robert Louis Stevenson and... thought it was ok. I think it very much falls into the category of books that I felt like I should have enjoyed due the the "classic" status, but I didn't care for it a great deal. I suppose a lot of it was due to the dialect used throughout that made it at times hard to read, but truth be told, I was glad was I finally finished it. That said, enormous props once again to the makers of the "Classics" iPhone app (which I used previously to read "Call of the Wild" and "The Adventures of Huckleberry Finn" and reviewed here and here respectively). Such a great user interface and with these three books down, I still have another fifteen different classic books I could read on this iPhone app should I choose. Well, yeah... the cover image of swimsuit model Bar Refaeli wearing body paint (or body text as the case may be) itself is noteworthy, but the text on her is taken from the Stephen King short story "Morality" contained within the issue. I didn't find the story linked to anywhere on the Esquire website, but suspect that's by agreement between the magazine and author. This being the case, the best I can do for links is provide this one to a description of "Morality" on http://www.stephenking.com/. The story itself is a compelling read which reminds me a great deal of the King short story "Apt Pupil"... contained in his collection "Different Seasons" (from which also came two short stories that led to the movies "Stand by Me" and "Shawshank Redemption"). Two other things I found interesting from this issue of Esquire... both of which are about one of my favorite writers, Chris Jones. The first was his extremely short (3 paragraph) piece titled "Arrivals at the Airport". In a way the polar opposite of "Morality" by King, it's.. nice. 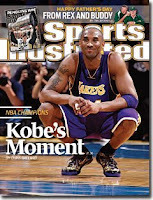 The second was mention of Jones being honored with a National Magazine Award for his Esquire piece "The Things That Carried Him". I wrote about Jones and this piece in what was kind of my first blog post and the story itself can be found here on the Esquire site. As someone that has happily owned a Toyota, Nissan, Toyota, Subaru and then Toyota in the 20-year car owning portion of my life, I'm now fairly amazed to be interested in what Ford Motor is doing. Press about it appearing to be the only solvent major US car company combined with two recent articles about new models make me think that maybe one day I'll actually own a Ford. In it's July issue, Esquire Magazine named it's 2009 Car of the Year... the Ford Taurus SHO. Never would have expected what I consider to be a pretty hip and forward type magazine to talk up a Ford like this, much less a Taurus, but the car is described (as part of an interesting and short read) in pretty glowing terms. Also, as the picture below shows... it is pretty. A second positive piece about Ford and the cars it's putting out comes from the June 15 BusinessWeek and is titled "Can Ford's "World Car" Bet Pay Off?" About current efforts at the automaker to pull off the sought-after car company trick of one model that is sold (well) globally, it focuses on the Ford Fiesta... already a success in Europe and Asia and launching in the US early 2010. The article talks about the Fiesta body lines being modeled after the BMW 3 series, but the Fiesta image below reminds me of a stubbier version of the Subaru Impreza (which I happen to own and like). Very interesting stuff... from Ford. I'm surprised, in a good way.